Prevention of safety accidents by learning installation method in heart! Please read carefully and be familiar with preparation stage (Rupture Disc Inspection and Holder Inspection), and installation methods to prevent safety accidents. lease take extra care when you hold the Disc and the Nameplate. Check sheet at the edge of the disk and surface of the dome if there is any groove, scratch, or stains that can cause leakage or affect rupture pressure. Do not install damaged disc. If damaged disc is installed, the disc can be ruptured earlier than scheduled and it may not function properly as a safety device. Inspect both sides of the sheet to which Holder Disc will be assembled. Dust or small sands can damage the Rupture Disc. Alien substances and damages can affect the operation of disc and it may damage disc or cause a leakage. Clean it as much as possible, and grind lightly before installation if there is a groove or damage on the surface of metal joints. Size and grade of the Holder shall be consistent with size and grade of the Flange. Rupture Disc and Holder should not be processed or modified without authorization of FDC. Arbitral process or modification will nullify the warranty of the product. Rupture Disc can be installed vertically or horizontally. Rupture Disc shall be installed according to the direction of material flow. 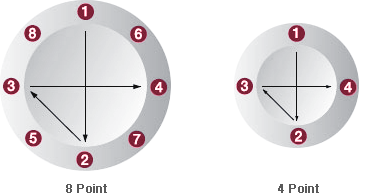 When handling a Rupture Disc, do not touch processed parts for pressure setting such as Dome molded part, Scored processed part, and Slit processed part. When you hold a Disc, be usred to use sheet at the edge of the disk so that it will not be damaged. The surface of both holders to which a Rupture Disc is assembled. It should be free from dust or damages. Bolt shall be tightened with the same symmetrical power according to the order shown in the following picture. ※ Note: Leakage can be prevented only when bolts are tightened with the same power following this order.